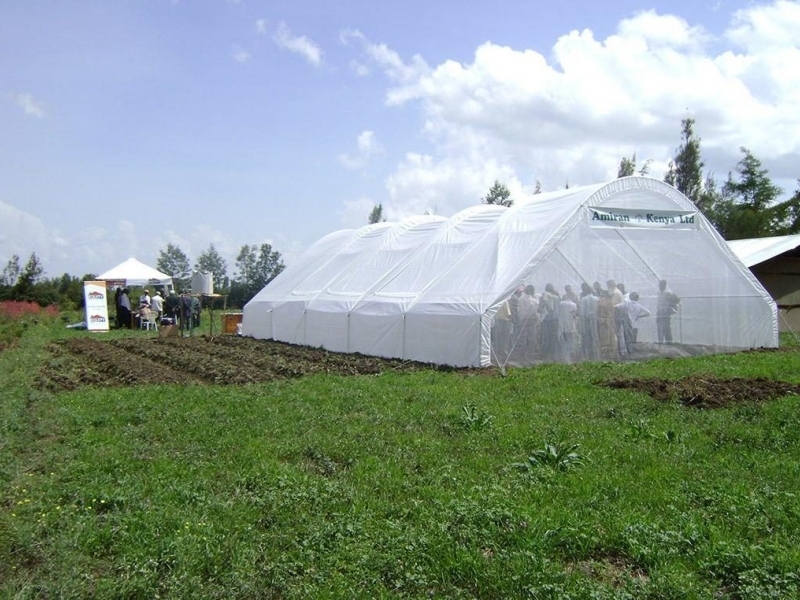 Amiran Farmers Kit is comprised of the highest farming inputs for a whole season of growing crops in the open field as well as the greenhouses. The farmer has the highest possible chances to succeed using this modern sustainable agribusiness farming unit, which has been designed and tailored for the success of the small holder farmer. The kit is comprised of Farmers Greenhouse: This provides a controlled growing environment for crops High Grade cover with guarantee Easy to control pest and diseases Long lasting steel Peaked roof allows for maximum growing space Minimal maintenance Additional metal reinforce structure GRAVITY FED DRIP IRRIGATION: Long lasting High-quality drippers with wide water passage to prevent clogging Even water distribution of water Maximum efficiency in water usage Gravity fed with reliable heavy duty Easily filled and drained Enables fertigation through the system Simple installation and maintenance SOLID WATER TANK: 200-1000l Strong and reliable material 7 year guarantee Portable and easy to refill water from top All connections and tank cover provided FARMERS SPRAYER: 16L Portable, held pressure and hand operated Top quality material resistant to all treatment products Ergonomic lance made of fibre grass Adjustable cone nozzle and high pressure chamber NURSERY SET: Set of trays Inert growing media for seed germination Includes starter feed for young seedlings Free plants from soil related diseases Germination leaflet GOLD MEDAL SEEDS: Farmers choice seeds High quality hybrid seeds Seeds for greenhouse and open field Seeds adjusted for specific famer FERTILIZERS: High quality fertilizers Defined application amounts for one season Convenient pack size Environmentally friendly Advanced modern technology AGRO-CHEMICALS: Designed cover for one season of crop High quality, certified, European standard pesticides Defined targets, guided amounts and application rates HEALTH AND SAFETY: Spraysuit, glove, mask and filter Safe use of pesticide training offered Measuring Cup TRAINING: Practically designed farmer training capturing Certificate GAPs compliance training AGRO SUPPORT PACKAGE: Visit on site by An agronomist for one cultivation season Constant on call agronomic support Consultancy Exposure of farmers to new technologies AMIRAN GROWING GUIDES: Professional growing guides allowing farmers to follow a clear step by step process suited to specific types of crops. AMIRAN FARMERS KIT INSURANCE: CIC Amiran farmers kit insurance covers the hardware components of tHE AFK against natural disasters.